There is nothing more quintessentially breakfast than a blueberry muffin. For me a blueberry muffin has to be chock full of contrasts. It should have enough sweetness to feel decadent, but balanced by the tartness of the blueberries and lemon zest. A perfect muffin also has a top that has a thin crust of spiced streusel and under it is the tender muffin, stuffed with fruit. I tried to put as many blueberries in this muffin as it could possibly hold without losing its structure. Blueberries alone have a subtle flavor, so they are there to add some flavor, but even more moisture to the muffin. I rarely bake scones, since my son was deemed the scone expert in the family. But, I had a craving and he was busy being a teenager, so I set off to make these caramelized white chocolate and peach scones myself. He came home and told me I did a nice job, so that is really all the endorsement you should require to know these are worthy. 😉 The peaches sitting on my counter were ripe, but not busting open with juice, so they were just right for adding to the scone. You want them to have flavor and be ripe, but still have some body, so they don’t turn to mush when you mix them into the dough. Typically I’m not a huge white chocolate fan, but I’ve been on a white chocolate caramelizing kick and thought it would be a lovely match for the peaches. Caramelizing white chocolate give it a bit of a nutty edge that it otherwise lacks and makes it way more flavorful and interesting. Caramelizing the white chocolate is something that requires a touch of patience, so I recommend doing it with a glass of rose wine (not so much that you forget to stir the chocolate) and settle into the kitchen for a bit. When I was a kid, in the 70s, my mom, my uncle, Jay, and I would go to a tiny Ukrainian restaurant on 2nd Ave in NYC called the Kiev. Finding a table was nearly impossible; I remember it being so crowded that we’d climb over people to get to our seats. Once we were situated, the waiter brought bread to the table. When the tower of challah came we could no longer see each other, which forced us to crane our bodies around this centerpiece to talk to one another. The crazy pile of delicious bread wasn’t even the main event. We were there for the cheese blintzes. 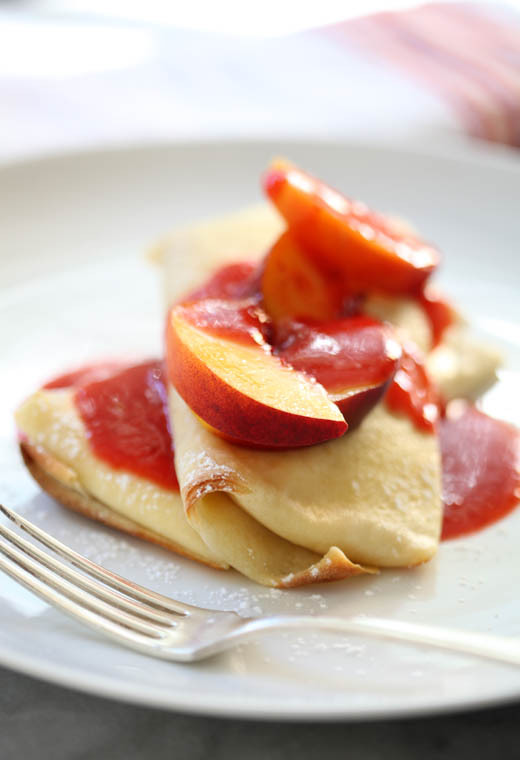 The slightly sweet, farmer cheese stuffed crepes. By the time they hit the table I was stuffed with challah, but I managed to eat everything in front of me. I loved that place and the feeling of leaving full, really full. I just googled the Kiev to see if it is still there and I am sad to report that only a glossy reproduction exist. To me it was the tight, atmosphere-free dining room, stuffed to the rafters with blintz-eating patrons that made it special. I am disappointed that I will never get to take my boys. Instead I’ll make them blintzes at home. All that’s missing is a tower of challah (I’ll save that for another day) and the slightly surly servers, but my blintzes are well loved. The key is finding fresh farmers’ cheese, not the dry crumbly version. I use a crepe recipe from my sister-in-law, Maxine, who spent her high school and college years in France. Top the creamy blintzes with whatever you like or just eat them plain with a brush of butter, and maybe some sour cream.